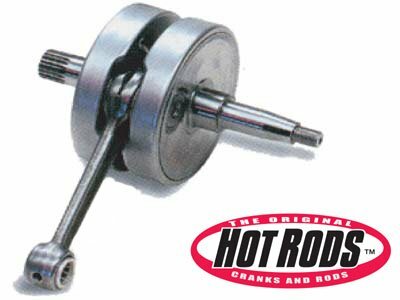 Technical Car Experts Answers everything you need: How to install crank and rod on kx85 ? Put the bearings in the freezer, heat the case half, once warm drop the bearing in, by the way this is after you've installed the seals, and don't heat around the seal area or you'll damage the seals. OK, you have the crank bearings/seals installed, now heat up a metal slug (solid steel about the size of the inner bearing race) to about 400-450 degrees, once hot place it on the inner bearing race and let sit for about 5 minutes, pull off the slug and insert the crank through the bearing (clutch side first) it should slide right in. OK, lay the right case on its side and install all the gears into the right case. 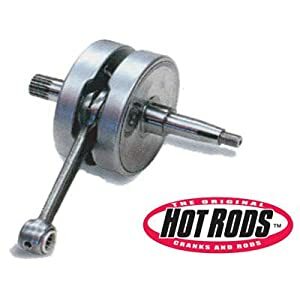 heat the slug again and place on the left side case bearing race, while it is expanding the bearing, apply case sealer on the right side case, bearing is expanded, slide the left side case onto the crankshaft, should slide right on, (rod at bottom dead center while doing this). Ideally you will use a special tool to support the crank so you don't knock it out of alignment, then you will tighten the case bolts. If it is tight you can tap on the end of the crank provided you have your special tool in place, otherwise your going to cause misalignment and you might as well order another wiesco crank cause you'll need it. This is an easy operation IF, you have the right tools, don't let anybody touch the ends of your crank without support or you'll cause misalignment. It depends on what part has seized. Drain your coolant, pull the exhaust pipe and carb, then remove the head. You should be able to see any damage to the top end by looking into the exhaust port or from the top. If the piston wiggles then the connecting rod or crankshaft main bearings are seized. If the piston is tight, then the seizure is there. Remove the cover over the flywheel and put a wrench on the crankshaft bolt. Work the engine forward and rearward. It may help to put oil or penetrating oil in the cylinder. If the main bearings are seized, try lifting up the cylinder and getting oil into the lower end. That will help free up the bearings. Tighten the cylinder back down so it doesn't twist and break a corner off of the base. Once you get it apart, inspect all the parts for damage. Be sure you find the cause of the failure before putting it back together or you will have the same problem. Check the water pump and crankshaft seals and take a look at the carb and jetting also. The most important tool is the crankshaft jig, becuase more than likely you will need to tap the crank one way or the other to get it centered up once the case halves are bolted together. Without the jig you do run a very good chance of pinching the flywheels together when you try tapping the crank to center alignment. Another tip is to put the crank the freezer for a while, but this will only help when doing the first (right hand) side. I have heard people say that this is hard on the rod bearing due to condensation, but that just isn't true, after all if you oil the bearing first, condensation won't be a problem. I have rebuilt several Honda mini's without a crank jig, but the seals go in afterwards and so you can heat the main bearing with a porpane torch if need be to align the crank for center. Can't do this on the little Kawi due to the seals going in first. If you don't have the crank tool for installation then make sure the rod is at BDC and when putting the case halves together use baby steps to pull the cases together and check the crank and both gear shafts for free movement. If the crank or either of the gear shafts bind up then stop and either pull the cases back apart or see what is making them bind. Factory assembled and trued to within .001". Meet or surpass OEM in performance and durability. Complete and ready for installation. Labels: How to install crank and rod on kx85 .